[172 Pages Report] The electronic sensors market for the consumer industry was valued at USD 11.94 Billion in 2015 and is expected to grow at a CAGR of 12.26% during the forecast period. The base year considered for the study is 2015 and the forecast period is between 2016 and 2022. The objective of the report is to provide a detailed analysis of the electronic sensor market for the consumer industry based on, type, application, and geography. The report provides detailed information regarding the major factors influencing the growth of the market for consumer industry. It also offers a detailed overview of the value chain in this market for the consumer industry. Sensor is a device which detects and responds to changes in its surroundings. It is used to measure various parameters such as motion, temperature, and pressure among others. They are widely adopted in consumer electronics across numerous devices such as smartphones, gaming consoles, PCs, home appliances, and kitchen appliances among others. The demand from the smartphones and wearable devices is expected to drive the growth of the electronic sensors market in consumer industry. Image sensors and motion sensors are the most widely used across various consumer electronics devices. The research methodology used to estimate and forecast the electronic sensors market begins with obtaining data on key vendor revenues through secondary research, such as Consumer Technology Association, IEEE Journals & Magazines and newsletters as well as whitepapers. The vendor offerings have also been taken into consideration to determine the market segmentation. The bottom-up procedure has been employed to arrive at the overall size of the market by estimating the revenue of key players. After arriving at the overall market size, the total market has been split into several segments and subsegments, which have been verified through primary research by conducting extensive interviews with key personnel, such as CEOs, VPs, directors, and executives. The market breakdown and data triangulation procedures have been employed to complete the overall market engineering process and arrive at the exact statistics for all segments and subsegments. The breakdown of profiles of primaries has been depicted in the figure given below. In-depth interviews of various primary respondents have been conducted which include key industry participants, subject matter experts (SMEs), C-level executives of key market players, and industry consultants among other experts to obtain and verify critical qualitative and quantitative information as well as to assess future prospects. The electronic sensors market for consumer industry ecosystem comprises sensor manufacturers and suppliers, OEMs, system integrators, sensors component providers, distributors, MEMS technology providers, CMOS technology providers, smartphone manufacturers, and wearable device suppliers. Companies involved in the manufacturing of electronic sensors include Sony Corporation (Japan), Samsung Electronics Co., Ltd.,(South Korea), STMicroelectronics N.V.(Switzerland) NXP Semiconductors N.V.(Acquired by Qualcomm), TE Connectivity Ltd., (Switzerland), Murata Manufacturing Co., Ltd.( Japan), Robert Bosch GmbH (Germany), Infineon Technologies AG (Germany), Synaptics Incorporated (US), Cypress Semiconductor Corporation (US), and Omron Corporation (Japan). The electronic sensors market for consumer industry is expected to reach USD 26.76 Billion by 2022, at a CAGR of 12.26% between 2016 and 2022. The growing demand for smartphones, smartwatch, emergence of fitness and activity trackers, and growing adoption of augmented reality (AR) based and virtual reality (VR) based headsets are the key factors driving the growth of the electronic sensors market for consumer industry. Image sensors held the largest share of the electronic sensors market for consumer industry owing to their huge demand in smartphones and digital cameras. However, the market for fingerprint sensors is expected to grow at the highest CAGR between 2016 and 2022 because of their growing adoption in a large number of electronic devices such as smartphones and laptops. These sensors are used to add another layer of security authentication for safe access of these devices. The rising mobile application ecosystem enables adoption of smartphones for ecommerce and financial transaction further makes fingerprint sensor as an essential requirement. Fingerprint sensors are also likely to be commercialized in computer peripherals such as mouse and keypad in the near future. The communication & IT application of the electronic sensors market for consumer industry which comprise smartphones, tablets, laptops, and desktop PCs is expected to foster the growth of the market in the near future. The availability of smartphone-friendly content demands the integration of numerous innovative features to facilitate the enhanced user experience and firm rivalry among smartphones suppliers would further propel the growth of communication & IT segment in the electronic sensors market for consumer industry. Wearable devices created altogether a new opportunity in front of the sensor suppliers begins with the introduction of smartwatches. The advent in technology has improved the wearable devices and it has propelled the adoption of motion sensors. Moreover, the enhanced processing capabilities of the wearable devices is further expected to fuel the demand of certain environment sensors, such as temperature sensors and pressure sensors. The electronic sensors market for consumer industry market for APAC held the largest market share in 2015 and also has the presence of key players such as include Sony Corporation (Japan), Samsung Electronics Co., Ltd. (South Korea), Murata Manufacturing Co., Ltd. (Japan). Rapid urbanization and increasing disposable income is driving the demand for consumer electronics in Asia Pacific. This phenomenon fostering the growth of electronic sensors in consumer electronics in Asia Pacific. The key driver for the electronic sensors market for consumer industry is the demand for the smartphones across the globe with emphasis on feature enhancement to deliver the better user experience. Market restraints are primarily the lack of a standardized fabrication process for MEMS-based sensors. Opportunities are the global demand and increasing adoption of wearable devices such as smartwatch, activity tracker, and VR headsets. Image sensors, motion sensors, proximity sensors, and fingerprint sensors are largely used in smartphones, while temperature sensors, pressure sensors, and level sensors are deployed in home appliances. 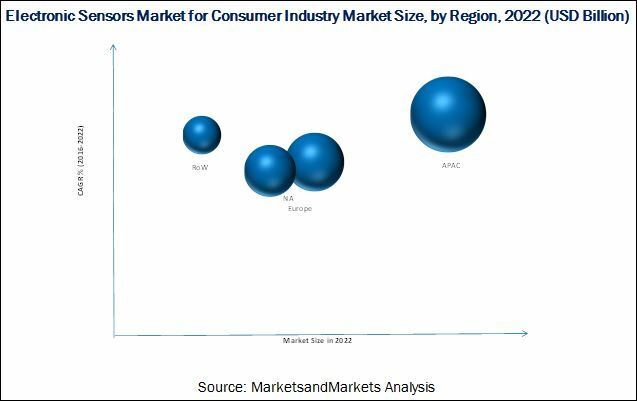 Market players involved in the manufacturing of electronic sensors market include Sony Corporation (Japan), Samsung Electronics Co., Ltd.(South Korea), STMicroelectronics N.V.(Switzerland), NXP Semiconductors N.V.,(acquired by Qualcomm), TE Connectivity Ltd. (Switzerland), Murata Manufacturing Co., Ltd.(Japan), Robert Bosch GmbH (Germany), Infineon Technologies AG (Germany), Synaptics Incorporated (US) Cypress Semiconductor Corporation (US) and Omron Corporation (Japan) are focusing on product launches, research and development, acquisitions, and collaborations to enhance their product offerings and business expansion. 11.3 Samsung Electronics Co., Ltd.
11.7 Murata Manufacturing Co., Ltd.